I am brazenly leaving the vegetable garden unprotected as the peas, spinach, and lettuce are all sprouting. Some would look out there and see those tell-tale signs of "disturbances" in the smoothly raked beds and say that I am foolishy leaving the vegetable garden unprotected. Truly, my indicator plant for the presence of hungry rabbits has always been not in the vegetable garden, but in the flower beds. Tulip foliage anyone? So far this spring, all the tulips remain un-eaten, so I remain hopeful. Hopeful that the rabbits will leave the vegetable garden alone. 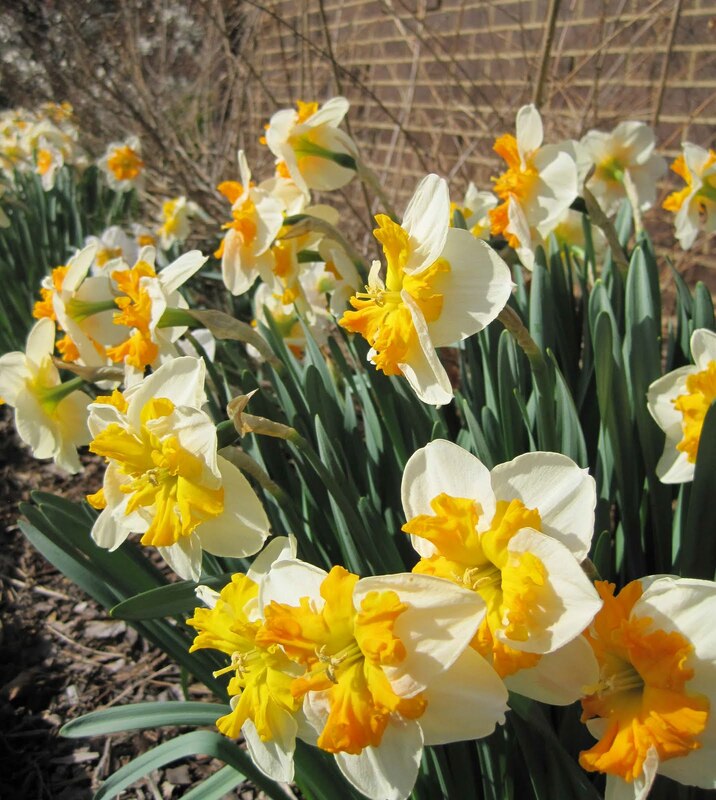 Hopeful that the Easter Bunny will see all the flowers, like the daffodils pictured above, and judge my garden as a worthy location for hiding a lot of plastic candy and money filled eggs. Hopeful that the egg hunters and gatherers will leave a few eggs for me to find later in the spring. To increase the odds of this happening, I purchased some "camo" colored eggs, purposely let some weeds grow here and there (cough) and perhaps most astounding of all, held off mowing the back yard so the grass would be tall and thick. Hopeful that the weatherman is right. Sunny skies and 70 F would be just right, I should think, to allow some of the Easter guests to enjoy time outdoors on the patio, the patio that his hopefully going to be replaced. Hopeful that once the Easter egg hunt is over that guests will take a few divisions of perennials from the flower beds, the ones that will be covered over with a new patio. Hopeful.That's the story of Easter and spring. A time of great hope, renewal, and new beginnings. I'm hopeful that all those things will come to pass for you! Happy Easter, Carol! I'm hoping too that the rabbits and the frost stay far away! I am hopeful that you have a great time in your garden today. I am hopeful that we wont get another freeze this year! Good luck with those rabbits. Personally, I am hopeful that the stink bugs won't destroy my tomato crop this year. A happy, hopeful Easter to you, Carol. May is right around the corner. Hope is a wonderful thing. What is gardening without hope? I hope your wishes come true Carol. I hope you had a lovely Easter. I really enjoy reading your blog. I have a rabbit that visits my garden too. Luckily the rabbit has not eaten anything yet. I am hopeful because I have just discovered that the clump of Van Sion daffodils (identified by Kathy Purdy last spring) have just opened. The weather has not only been warm, it has been hot - and we are promised a few more hopeful days of heat.